How to correctly use Firebase-Analytcs for A/B testing? 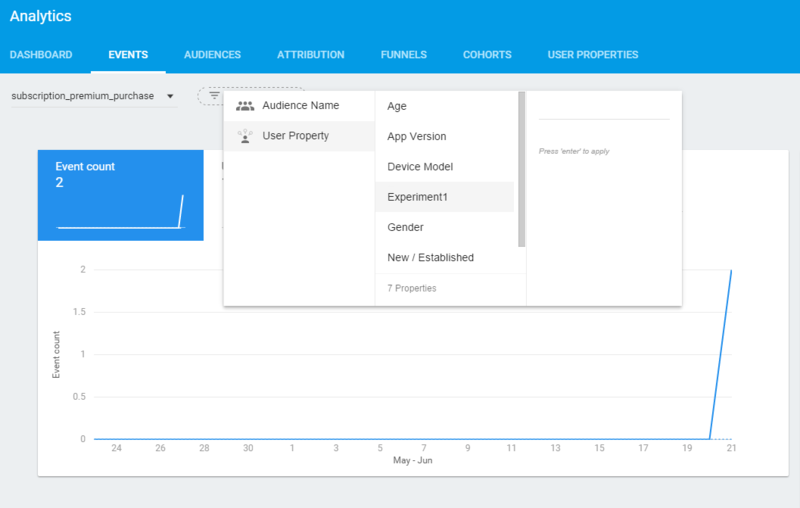 Google has published a whole new API and services for A/B testing, using Firebase Analytics and Firebase Remote Config. While I do try out the service for other purposes (here and here), I also need to use it for A/B testing. Thing is, I can't find out how to make it show the needed information for analyzing the results of variants of the experiments. Creating a new user property for each experiment (just one for now). In remote config screen, add 2 variants (default and conditional). Upon loading the remote config , calling setUserProperty (see #0), as shown in the tutorial, to point to the current variant's parameter value. One of the calls (only one for now), as you might have guessed is when eventName is "subscription_premium_purchase" . When running the app, I caused it to use both variants (one for each clean installation, of course). But as I've shown, I can't find a way to determine which variant caused the event to be called more than the other, for example. What might be missing here? What have I done wrong? Why can't I see any variant that I've used? What is the user property for, anyway? Is it used as a "glue" between Remote-Config and Analytics? What am I supposed to enter in the textbox there (it says "Press 'enter' to apply") ? Doesn't it suppose to show the various variants? Other filters items have "types", yet this one doesn't. There is nothing to choose from the user property. Even when creating a user property, I can't see any settings for it (except for description). I can't even delete it. There is no way to see the conditions I've created in the graph. Do I need to use BigQuery, perhaps? I've noticed that the "fetch" function sometimes doesn't get the listener to be called at all. How could it be? Can I add a timeout for this? I think the key confusion here is related to the fact that you don't see your values as auto-complete suggestions when you chose the Experiment user property. This is a feature that is being considered. But if you just type in your Experiment values, it will apply that as a filter on your reporting so you can see how many "subscription_premium_purchase" events were logged by users in one variant versus the other. Not the answer you're looking for? Browse other questions tagged android firebase ab-testing firebase-analytics or ask your own question. How to move from Google-Analytics to Firebase-Analytics? How to correctly use and track App-invites? How to add Firebase custom events for analytics?